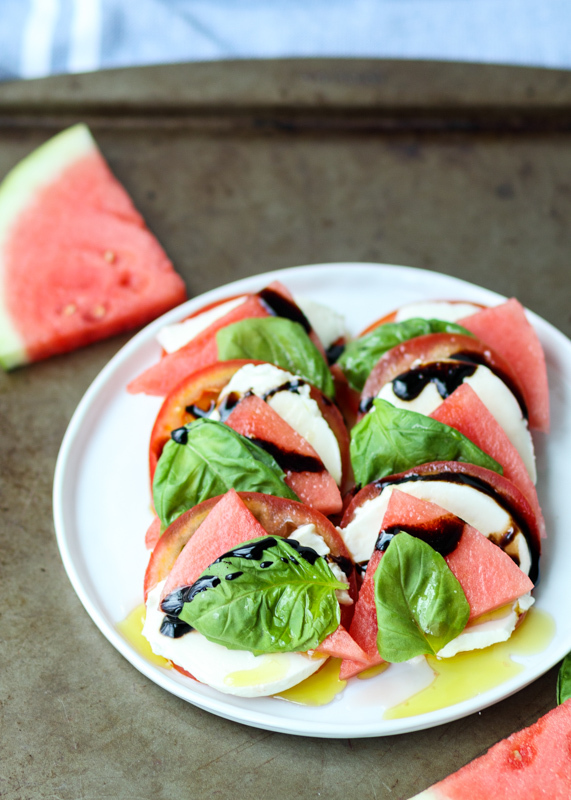 Layer the caprese salad. I like to do a tomato slice, topped with a mozzarella slice, topped with a watermelon slice, then finally topped with a basil leaf. I usually plan on 2 stacks like this per person, depending on how many other sides there will be. Arrange the stacks so they are layered over one another. When you are ready to serve, drizzle with olive oil and balsamic glaze. Sprinkle the salt over top then serve. You can find balsamic glaze at the grocery store - Trader Joe's has a great one. If you want to make your own: combine ½ cup good quality balsamic vinegar with 2 tablespoons brown sugar in a small saucepan over medium heat. Stir until the sugar has dissolved. Bring to a boil then reduce heat to low and simmer until the mixture is reduced by half, about 10 minutes. The glaze should be thick and syrupy. Let cool before serving. Store in the fridge in an airtight container for up to 2 weeks.